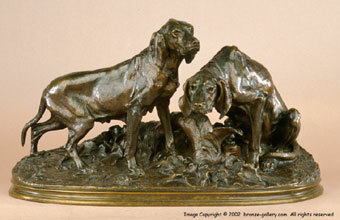 Pierre Jules Mene sculpted this fine model of Two Pointers in 1857 at the height of his career. 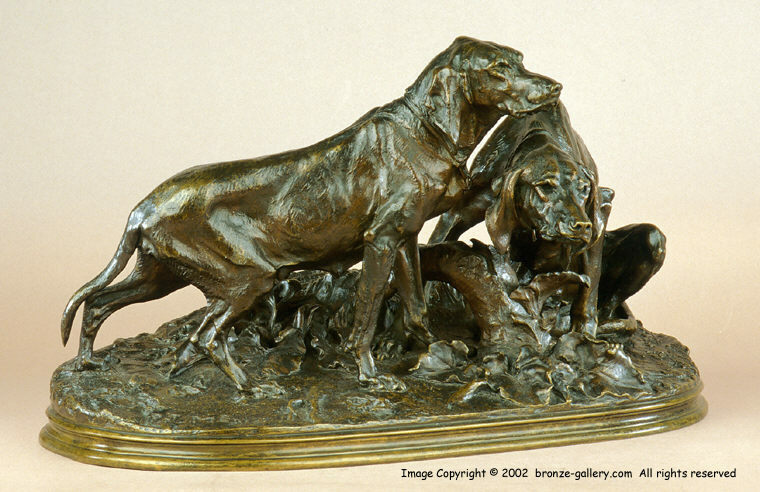 These Pointers were also done as separate sculptures but they lack the presence of the dogs sitting together on the elaborate base with foliage and a large tree stump. Large exhibition size bronze sculptures by Mene rarely come on the market as he cast very few outside of special requests. This magnificent sculpture of his model of two Pointers at rest is cast by Mene himself with meticulous attention to detail both in the foundry work and the patina. Mene was considered to be the finest sculptor of dogs during his lifetime and this bronze more than justifies that respect and title. Hunting dogs were the most popular and Mene's Pointers, Setters, and Hounds are superb depictions of their respective breeds. 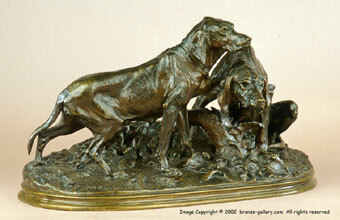 This bronze would be premier addition to any collection of 19th century Animalier sculpture. 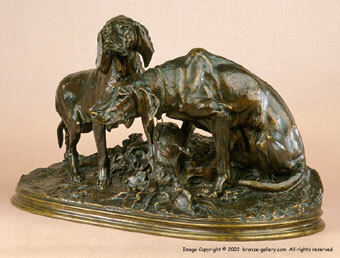 A model of this sculpture was exhibited by the artist at the 1857 Salon.